Joe Jonas was spotted in Sayulita and Punta Mita attending the wedding of Nick Lachey and Vanessa Minnillo during the first weekend in April. Joe Jonas of Jonas Brothers fame caused a stir in Sayulita and Punta Mita the first weekend in April when he attended the wedding of his friends Nick Lachey and Vanessa Minnillo. The world famous pop star published images on his Twitter and Instagram accounts on the 5th and 6th of April, where he showed off the beaches of Sayulita and himself on a burro. He also posted a photo of his friends Nick Lachey y Vanessa Minnillo, who were married in Punta Mita. A traditional “wish balloon” or globo de cantoya was also released to wish the best of luck to the newlyweds. The young star took the time to have his picture taken with a few very fortunate fans who didn’t waste any time posting their pictures with the singer. Nick himself was a pop star during the 90s when he was part of the group 98 Degrees; he’s also known for his liaison with Jessica Simpson. His actual partner, Vanessa, is an actor and show hostess. She was also Miss Teen USA and is well known for hosting the show, Total Request Live on MTV. Events like these are a strong indicator of the Riviera Nayarit’s privileged position as a top luxury beach destination, much sought-after by international celebrities. It’s also important to note the constant promotion of the destination as a romance, wedding and honeymoon venue, as there have been several celebrity weddings taking place here lately and there appear to be more on the horizon. 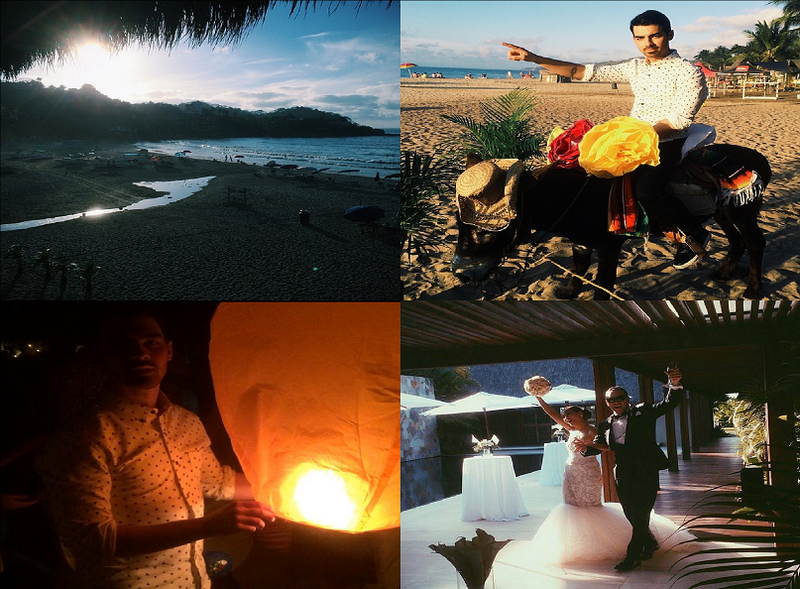 Joe has over 7 million followers on Twitter and another 800 thousand on Instagram, which is excellent exposure for the Riviera Nayarit—and that’s not even counting the many followers Nick and Vanessa have on their own, whose wedding was followed using the hashtag #nickandnessa2014. Here are the links to their posts on social media: http://instagram.com/p/mZVMaij8Nk/, http://instagram.com/p/mY8Mrnj8L3/, http://instagram.com/p/mZMnr9D8D7/.